Death of Fr. Stephen McCabe, Redemptorist. Fr. Stephen loved music, as did all his family. He played the button accordion with great skill. The Month’s Mind Mass for Fr. Stephen McCabe, Redemptorist, was celebrated on Sunday Nov. 30th at 3pm in Marianella Chapel, Orwell Road, Rathgar, Dublin. The chapel was packed with people who knew and loved Stephen and/or members of his family, and the Redemptorists. Your prayers are requested for the happy repose of the soul of Fr. Stephen McCabe (aged 63) who died at 6.40am this morning (Monday 27th October 2014) after a long struggle with cancer, in Fortaleza, Brazil. Fr. Albert McGettrick was with him when he died. Fr. Stephen grew up beside Orwell Road in Rathgar in Dublin, very near Marianella, the Redemptorist Community on Orwell Road. We offer our deepest sympathies to Fr. Stephen’s sisters and brothers. May he rest in peace. Stephen’s remains will be brought to São Raimundo church (in Fortaleza, Brazil) at noon today (Monday). Funeral Mass to-morrow Tuesday at 9.00am and burial afterwards in the cemetery PARQUE DA PAZ – all times local to Fortaleza. At a date to be arranged with Fr. Stephen’s family there will be a Mass in Marianella. For now let us remember Stephen in our prayers. 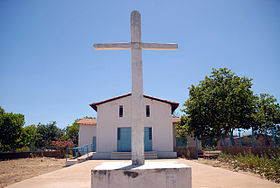 The Catholic Church in Nazária in Piaui, were Fr. Stephen worked for several years in recent times. Fr. Stephen McCabe was born in 1951, professed a Redemptorist in 1970 and ordained a priest on June 3rd, 1978. He was diagnosed with cerebral cancer a few years back, and died in Fortaleza in Brazil today, October 27th, at the age of 63. Fr. Stephen was greatly loved among all of us Redemptorists, both in the Dublin Province, and in the Vice-Province of Fortaleza. He was a man of immense kindness, gentleness, joy, wisdom, prayer,- and a great musician who entertained us on different occasions. May his dear soul rest in the embrace of God whom he served with such devotion and dedication and joy as a Redemptorist priest. Ar dheis De go raibh a anam dilis! The following was sent to us today, written by one of his confreres in Brazil, Fr. Brendan McDonald. Rev. Stephen Paul Mc Cabe C.Ss.R. On the 27th. of October 2014, at the Curé d’Ars Hospital in Fortaleza, Brazil, Father Stephen Mc Cabe went to his eternal reward after a long period of illness bravely and camly borne. Father Stephen was born in Dublin, Ireland, on the 14th. of August 1951. He was the eldest son of Michael Mc Cabe and Kathleen Kiernan. He had two brothers and three sisters who came to visit him in Brazil shortly before his death. He was baptized at Saint Andrew’s Church in Dublin. His primary education was done with the De La Salle Brothers and his secondary education with the Christian Brothers both schools being in Dublin. In 1969 the Christian Brothers organized a retreat for their students. The retreat was preached by the Redemptorists. At the closing of the retreat Father Denis Farrell C.Ss.R. invited Stephen to become a Redemptorist. Despite some inicial misgivings on his mother’s part, as she considered the Redemptorists a very rigorous and austere religious congregation, Stephen began his postulancy followed by his noviciate in 1969. He was professed on the 1st. of September 1970. He read philosophy at University College, Galway from 1970 to 1973. This was followed by his theology course at the Spiritain Missionary Institute [Kimmage]. Stephen spent two years on a period of probation in Brazil from 1975 to 1977. This time was mainly to study Portuguese, and to adapt to the climate and customs in Brazil. He spent most of this time in CENFI (Center for Intercultural Formation) in Brasília. In 1977/1978 Stephen returned to the Spiritan Missionary Institute in Dublin to complete his theological formation. On the 5th. of Feburary 1978 he made his final profession and on the 3rd of June that same year he was ordained a priest. Returning to Brazil in 1979 Stephen was sent to Teresina the capital of the State of Piauí where he spent many years including some as Parish Priest. He also worked in a poor district called Serviluz as well as in a very poor district called São Miguel, Messejana both in the city of Fortaleza. He also spent some time in formation with our postulants in Bela Vista, Fortaleza. Father Stephen spent his last years working in Paraiso do Tocantins, and in Nazária in Piauí. He was working in the Interprovincial Noviciate in Campina Grande when he was diagnosed with cerebral cancer. He suffered this illness with great patience and admirable courage. Father Stephen was a man of profound faith and an intense spiritual life among which traits were noted: his spirit of prayer, his fervent priestly ministry, his beautiful witness of a simple and austere life, his total understanding of the evangelical message, his great dedication to his religious confreres, his sincere welcome and respect for the poor, his constant smile and jovial manner, his serenity, peacefullness and freindly manner of being as well as his dedication to study and work. Father Stephen liked to visit the communities on the perifery of the city, as well as the abandoned communities in the interior of the state. 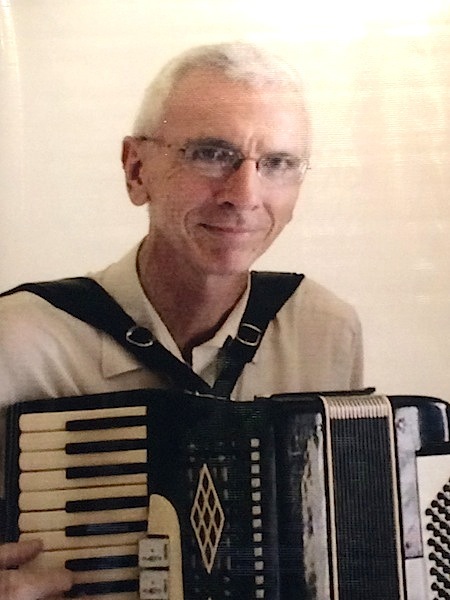 He was a great musician and many Redemptorist feasts and liturgies were animated by his accordian or organ playing. A poet once said: “Nobody dies while he lives on in someones heart”. I know for certain that Stephen is very much alive in the hearts of his Redemptorist confreres, the members of his family and the countless friends he made during his priestly ministry. Stephen, may the heavenly choir receive you and bring you to the Holy City, the Heavenly Jerusalem, where you will have your well earned eternal rest and the crown our holy founder Saint Alphonsus promised to us Redemptorists who were faithful and persevered in their vocation. Fr. Brendan Coleman Mc Donald C.Ss.R. Notícia: [NOTA DE FALECIMENTO] Pe. Estêvão Mc Cabe C.Ss.R. Faleceu por volta das 3.38 horas no dia 27 de outubro de 2014 no Hospital Cura d’Ars, em Fortaleza no Ceará, depois de uma longa doença corajosamente enfrentada, o Padre Estêvão (Stephen Paul) Mc Cabe. O falecido nasceu em Dublin, Irlanda no dia 14 de agosto de 1951. Foi o primeiro filho de Michael Mc Cabe e Kathleen Kiernan. Teve dois irmãos e três irmãs. Foi batizado na Igreja de Santo André em Dublin. Sua educação primária foi feita com os Irmãos De La Salle, e cursou o colegial com os Irmãos Cristãos, ambas as escolas sendo em Dublin. Em 1969 houve um retiro espiritual na escola dos Irmãos Cristãos pregado pelos Padres Redentoristas. No final do retiro Pe. Denis Farrell C.Ss.R. convidou o jovem Estêvão para ser redentorista. Apesar do receio de sua mãe que considerou a Congregação Redentorista muito rigorosa e austera, Estêvão começou o postulando seguido pelo noviciado em 1969. Fez seus primeiros votos no dia primeiro de setembro de 1970. Cursou filosofia na Universidade de Galway de 1970 até 1973, e de 1973 até 1975 seu curso de teologia no Instituto Missionário dos Padres Spiritanos. De 1975 até 1977 fez estágio de dois anos aqui no Brasil. O estágio foi principalmente para aprender a língua portuguesa e adaptar-se ao clima e aos costumes brasileiros. Com esse estudou no CENFI Centro de Formação Intercultural) em Brasília. Durante os anos 1977 e 1978 terminou seu curso de teologia no Instituto Missionário dos Padres Spiritanos em Dublin. No dia 5 de fevereiro fez sua profissão religiosa permanente e no dia 3 de junho de 1978 foi ordenado presbítero. Voltando ao Brasil em 1979 foi nomeado para Teresina, Piauí, onde ficou por muitos anos. Trabalhou também aqui em Fortaleza em Serviluz, na área da Praia do Futuro e na favela de São Miguel em Messejana. Passou alguns anos na formação dos postulantes no bairro de Bela Vista. Seus últimos anos de vida encontrou Pe. Estêvão trabalhando em Paraiso do Tocantins, em Nazária no Piauí, e depois no noviciado Interprovincial em Campina Grande. Nesta última cidade foi diagnosticado com câncer cerebral e lutou contra essa doença até sua morte com grande paciência e admirável coragem. Pe. Estevão foi um homem de profunda fé e intensa vida espiritual na qual se destacam um espírito de oração, fervoroso ministério sacerdotal, boníssima testemunha de vida simples e austera, brilhante inteligência com total dominação da mensagem evangélica, total dedicação aos seus confrades, acolhimento alegre e sincero com sensibilidade e respeito aos pobres e menos favorecidos, sempre sorridente e jovial, era de fácil convivência, pessoa serena, simpática, dedicado ao estudo e trabalho. Pe. Estêvão gostava de visitar as comunidades na parte periférica de Teresina e as comunidades mais abandonadas no interior. Dotado com inteligência musical, Estêvão como sanfonista alegrou muitas festas redentoristas e festas do povo além de celebrações litúrgicas. O poeta disse: “Ninguém, morre enquanto permanece vivo no coração de alguém”. Tenho certeza absoluta que Estêvão está muito vivo nos corações de seus confrades, de seus familiares e nos corações dos incontáveis fieis que o ama. Querido Estêvão que o coro festivo te acolha e te conduza à Cidade Santa, à Jerusalém Celestial, para que tenhas um descanso eterno. Por Pe. Brendan Coleman Mc Donald C.Ss.R. ← All Saints, and Holy Souls: November 1, 2: Also, Samhain Celebration.